It is time to write about another one of our residents, a bird that is only somewhat migratory, and at the same time, introduce the readers to a new group of birds – the owls. Most owls, but not all, are nocturnal. That is, they are active only at night. Because owls do not have sonar capabilities (the way bats do), they, as a group, have developed a number of characteristics that make them special, as it were. First, an owl’s feathers have special barbs on them that allow the bird to fly in complete silence. In other words, there is no “flapping” or “whooshing” sound as the bird flies through the air. This feature allows the owl to fly right up to its prey without the prey ever hearing it. This characteristic is unique to owls and of tremendous advantage to them. Second, their eyes have several adaptations that allow them to see in very poor light (no owl can see in total darkness). The eyes are disproportionately large in relation to an owl’s body size. Most birds (and man) have two kinds of cells in their eyes – rod cells to pick up light, and cone cells to pick out colour. Because much of the eye is occupied by cone cells, these creatures see colour, but have poor vision in dim light. There simply are not enough rod cells! They are always diurnal (active only during the day). To overcome this problem, owls have evolved with rod cells only. They do not see colour, instead they have excellent vision in dim light because of the very large eyes that are full of rod cells only. This is a great advantage for a predator. Third, in order to physically allow an owl to have such disproportionately large eyes, there are no eye muscles to move the eye around the way man does. This lack of muscles provides more room in the owl’s head for larger eyes, but the eyes are now “stuck” permanently facing forward in a stationary position. To overcome this drawback, the owl has nine vertebrae in its neck (man has only seven) allowing it to turn its head almost 360 degrees (man can barely turn his head 180 degrees). Four, scientists now believe that many birds, especially predators, can see ultra violet light (man cannot). Apparently, most rodents’ waste (urine and feces) give off ultra violet light which the owl can see and thus help it to zero in on its prey. Five, anybody who has seen an owl or a picture of one is always struck by the eyes being surrounded by a disc or dish of feathers giving the bird its “owl” look. These feathery discs are not cosmetic in nature, but are sound gathering devices much like the dishes people use to receive satellite signals. These discs amplify the quietist of sounds so that an owl can hear a mouse scurrying across a forest floor quite some distance away. In addition, the ears are offset a little forcing sounds to reach the ears at slightly different times. The brain is then able to process the sounds so that the owl can focus on the origins of the sounds with great precision. In fact, in several experiments owls were able to catch rodents in buildings where there was absolutely no light. They did it by hearing alone! This week’s featured bird is the smaller of our two “eared” owls – the Long Eared Owl. This slender crow-sized owl is very secretive. Being nocturnal it is commonly seen, if seen at all, in the daytime hugging the trunk of a tree usually in dense brush. Even though it is quite common it is often overlooked. The “ear” tufts are not ears at all but feathers that are there for purely cosmetic reasons. This is one of the few owls that actually “hoots”, but it also barks like a terrier if it or its young are threatened. 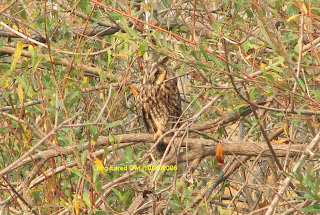 The Long Eared Owl occurs throughout the northern hemisphere north to the tree line. It usually stays away from deep forest preferring to live at the forest’s edge, or in prairie bluffs – especially if evergreens are present. It nests almost exclusively in old crow’s nests. By knowing where crows nested one year can be quite helpful in finding a Long Eared Owl’s the next. I was lucky enough to see and get a photo of this week’s bird at San Elijo Lagoon just north of San Diego. This owl is somewhat migratory and, in the winter time, can only be seen in the southern part of our province.